On behalf of Lionsgate Premiere, we're excited to bring you the action-packed new trailer and poster for Dragon Blade! Starring Jackie Chan, John Cusack and Academy Award winner, Adrien Brody, this epic international success releases in select theaters & On-Demand September 4th! A massive hit this year in its native China, Dragon Blade is ready to bring its grand scale action spectacle to US audiences. 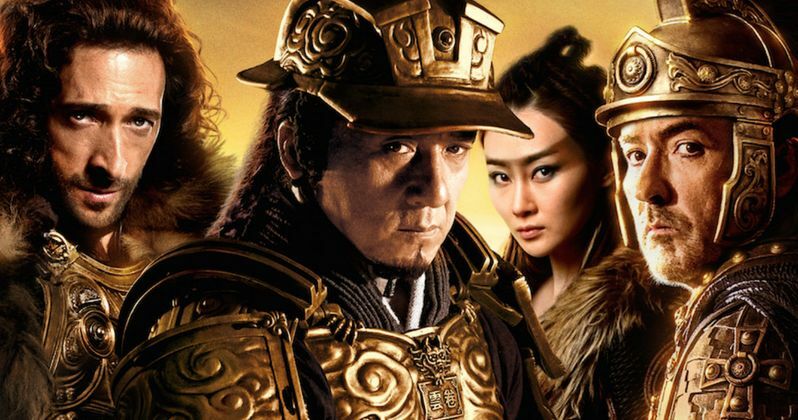 Dragon Blade follows the fight for the Silk Road, where East and West collide. When corrupt Roman leader Tiberius (Adrien Brody) arrives with a giant army to claim the Silk Road, Huo An (Jackie Chan) and his group of trained warriors teams up with an elite legion of defected Roman soldiers led by General Lucius (John Cusack) to maintain the delicate balance of power in the region. To protect his country and his new friends, Huo An gathers the warriors of thirty-six ethnic nations together to fight Tiberius in an incredible epic battle. The film is directed by Daniel Lee and produced by Jackie Chan and Susanna Tsang. This new trailer shows off a different kind of a Jackie Chan. This is a war epic with no crazy, silly stunts, but amazing fight choreography and cinematography that you must see to believe. Mark your fall calendars, because Dragon Blade is the action spectacular you don't want to miss!